Telemedicine platforms and tools will transform virtual care by incorporating emerging technologies and novel uses of data. While the use of telemedicine systems has been expanding in recent years, especially as more payers have begun reimbursing for some telehealth services, the industry is on the verge of more widespread virtual care. But what will that ultimately look like? The next generation of tools will feature enhancements ranging from chatbots, machine learning and genomics to remote diagnostic tools and better sensors. Here’s a look at what to expect in the near future. Both machine learning and automation are trying to solve an inherent issue in virtual healthcare: scalability, said Roeen Roashan, senior analyst of digital health at consulting firm IHS. "Machine learning is making its way to remote patient monitoring." To truly reach scalability, certain functions of virtual healthcare must be decomposed and outsourced back to the patient, he added. Therefore, one needs automation, and systems that are led by the patient, but where the value is driven by, for example, chatbots, he said. This is not to say that mental health is better delivered through chatbots but, rather, that certain aspects of care should be automated. These mental health patients actually preferred to speak with a bot, and most conversations took place between 10 p.m. and 3 a.m., often including taboo topics, Roashan explained. As Roashan believes machine learning has a role to play in the next generation of telemedicine technology, Joel Barthelemy, founder and CEO of GlobalMed, a telemedicine technology vendor, added that artificial intelligence can dramatically improve telehealth. "With the advent of genomic medicine, telemedicine will be used to provide much more personalized care to people based on their genetic characteristics. " The AI engine will tailor these questions to what it already knows about the patients and what their answers reveal, he added. It will not ask questions that other providers have already asked because the answers will be online in the patient’s personal health record, he explained. Currently, the U.S. Food and Drug Administration does not allow a device to diagnose a patient without the input of a physician. But an AI engine could say there’s an 84 percent chance that a patient’s stomach symptoms are related to the flu and that there’s a 4 percent chance they are due to indigestion. A doctor could receive this report and decide whether or not he or she agrees, Barthelemy said. In that case, they might contact the patient and ask some more questions; but in most cases, patients will no longer have to see primary care doctors in person, he contended. On another front, sensor technologies built into households and consumer electronics that can trigger consumption of as-needed medical services may be about to change population health forever, said Roy Schoenberg, MD, CEO and co-founder of American Well, a telemedicine technology vendor. "This real-time loop that combines sensors, analytics and telemedicine marks the transition from passive to proactive healthcare." The implications will extend not only to how people experience care, but also to the practice of medicine, healthcare cost, healthcare policy, and quite likely how people age and longevity, he added. Another next-generation feature of telemedicine will be genomic therapy, Barthelemy said. Based on a patient’s genetic makeup, and what is known about how patients like them respond to various therapies, a group of geographically scattered doctors who are being advised by AI engines will use telemedicine to confer and quickly decide how best to diagnose and treat that patient, he explained. And a new breed of remote telemonitoring and diagnostic tools that allow patients and physicians to interact in a way that closely mimics an in-person experience will highlight the next generation of telehealth, said Cory Costley, chief product officer and co-founder at Avizia, a telemedicine technology vendor. 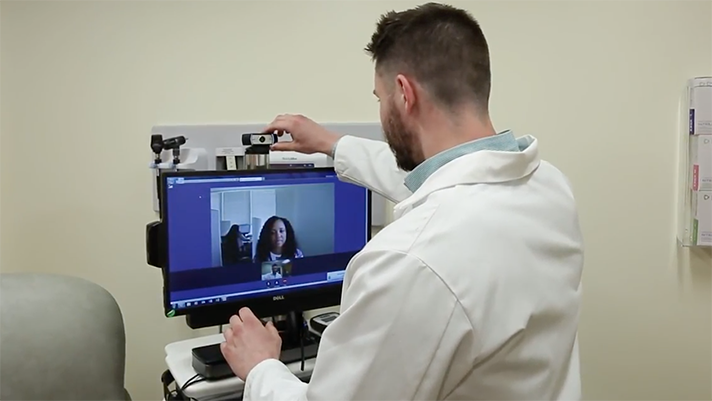 “Today, there are a handful of telehealth platforms equipped with state-of-the-art functionalities, such as enhanced far-end camera control and real-time data from connected peripherals to empower a remote physician to examine a patient’s physical appearance and capture images or sounds of the body,” Costley said. Five years ago, some of these diagnostic examinations weren’t possible at such a high level, he said.